Scott Christopher Homes was proud to support the Second Annual Building Hope event to support disease research and science education at Van Andel Institute. 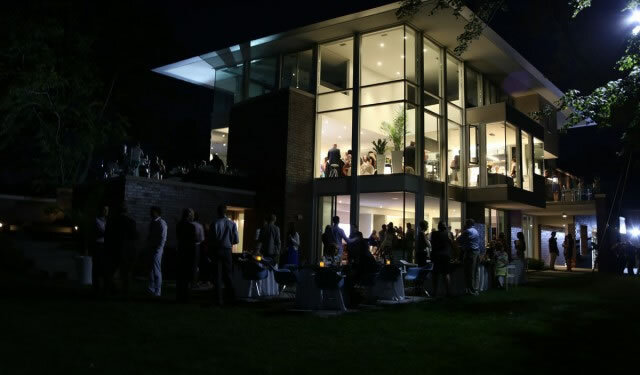 This event featured an exclusive peek of an amazing Lake Macatawa waterfront home, strolling dinner, a jazz band and more. Together we raised $50,000 to support Van Andel Institute. Scott Christopher Homes, Young and Young Architects and Via Design collaborated to host One Wild Night – a fabulous event – like no other – to raise money for Artprize. SCH awarded excellence in $750,000+ category! Congratulations to Scott Christopher Homes they swept the Awards of Excellence $750,000 + category! Thank you to all the sponsors and guests who helped raise $50,000 for Van Andel Institute with the first annual Building Hope event. On October 3, 175 guests received a sneak peek of an exclusive waterfront home built by Scott Christopher Homes. Guests enjoyed a strolling dinner; cocktails and live entertainment along with the opportunity to meet the team who created this amazing home. The building community comes together to create massive house of cards…..
Nearly 10,000 cards in all were decorated and assembled. The end result was a massive display of community art work. Scott Christopher Homes participated in Community Repair Day to help low income and elderly homeowners make essential repairs to their home. This annual event is a partnership with HBAGGR and Home Repair Services. Scott Christopher Homes and Via Design joined forces to Knock Out Hunger by participating in Canstruction at the West Michigan Home and Garden Show held at DeVos Place. After the show, the cans of food were then donated to the Salvation Army ‘s Booth Family Services where they were delivered to people in need. GRAND RAPIDS, Mich., July 9, 2010 – After more than a quarter-century of building luxurious family homes, the latest project at Scott Christopher Homes is a unique, high-end children’s playhouse being built in the name of charity. The Grand Rapids-based homebuilder is donating the 12-foot-high playhouse, valued at approximately $18,000, to the fight against cancer. The “House of Hope” will go to the highest bidder during a fundraising auction at the American Cancer Society’s eighth annual Cattle Baron’s Ball, to be held Aug. 13 at the Steelcase Town Hall, 1111 44th St. SE, Grand Rapids. “It was a way to come together as a team to produce something good for the community and for an individual, but also as a way to help the American Cancer Society raise money,” said Matt Reinsma, director of operations at Scott Christopher Homes. Scott Christopher, who founded the company in 1982, has a personal stake in finding a cancer cure. His mother was diagnosed with breast cancer about two years ago. After receiving medical treatment, her cancer is now in remission. Company employees are volunteering their time to construct the playhouse, which will measure about 10.5 feet by 12 feet when completed and feature a loft, a seating area with a table and chairs and a deck. There will be a kitchen appointed with facsimiles of appliances. Even landscaping will be included. “We wanted to build something that was really going to generate some excitement out there,” Reinsma said. Kids who go to the company’s website at www.scottchristopherhomes.com/playhouse can win prizes by entering a playhouse coloring contest. As it has many times in the past, Scott Christopher Homes turned to Via Design in Grand Rapids for help. The company donated its design services for the playhouse. Scott Christopher Homes has a long history of making anonymous charitable contributions but decided to openly promote its donation of the playhouse in an effort to inspire philanthropy at other businesses. The homebuilder’s generous contribution of the playhouse to the fundraising auction is appreciated, said Linda Powers, distinguished events specialist with the American Cancer Society. Employees of Scott Christopher Homes as well as its sister companies, Surpass Renovations and The Custom Shop, are encouraged to volunteer for community service because it boosts morale and builds teamwork, Reinsma said. Some workers have previously donated their skills to such organizations as Habitat for Humanity and the Boys & Girls Club of Greater Holland. The company specializes in constructing larger homes worth more than $1 million but also builds well-appointed cottages and smaller houses worth upward of $500,000. Its homes stand throughout greater Grand Rapids, and as far north as the Traverse City area and as far south as South Haven. Scott Christopher Homes always has two primary goals when constructing a home, Reinsma said. One is to provide its clients with the most accurate upfront cost estimates. The other is to complete the work more quickly than other companies by being more organized and avoiding construction delays. “Many organizations in town will sell the client low in an effort to get them drawn in and then proceed to charge them for extras along the way,” he said. “That’s a philosophy and approach that, long-term, just doesn’t work. If you’re presenting them with a cost increase every other day, that’s not fun.